I work long shifts, so some days I only get to see the girls for an hour or so in the morning and then they’re mostly in bed by the time I get home. I say mostly as Dot is usually still up. Other days, I leave before they are awake and get back just before bedtime. The flip side of this I that I get lots of days off during the week when other daddies are at work. My favourite kind of days are when I’m off, the girls aren’t at playgroup, or any other group and we can have a leisurely day at home, playing with toys and generally doing as we please. We call them family days. Most of the time these family days are a picture of family bliss. We play lego, build dens, draw pictures, go to the park etc. Sometimes though me being off work can be a bit of a novelty, especially when we are all together for the whole day, with no playgroup. My wife says my presence is disruptive. It’s not deliberate, but she has a point. The girls are extra cheeky, extra wild. It’s like they know when there is another parent around they can push the boundaries a bit more. When my wife is at home with all 3 girls, they are more compliant. It’s like they know she’s up against it looking after all three of them, so they go easy on her. Take your foot off your sisters head. Please don’t scratch your sister with a pig. Please stop tickling me with your cold little foot. *Delivers lovely hot peanut buttered toast. Nobody even looks up. * Thank you Daddy! Why are you crying? Her toast is exactly the same as your toast! We have lovely chairs just here and you are sat on a toy suitcase and you’re sat on a candle holder. Please don’t spit on the windows. What has happen to that orange, it looks like it has exploded? I’ve asked you not to spit on the windows. Why is everyone poking spoons down the radiator? Poking spoons down the radiator is not a game! Oh I see, there is a game stuck down the back of the radiator. Why? Why are you calling me Oli? It’s like you don’t know there is another option, other than your sleeve, for wiping your nose. Please just eat your own cucumber. Nobody said you had to spit out the stolen cucumber. Our girls are fiercely independent. Well Boo and Tibs are. Dot is usually physically attached to my wife, even at nighttime. She holds on to her top or hair, just so she can’t be put back in her own bed after a feed. Anyway I digress. My point is that our girls know their own minds, and if that means they are a bit cheeky and don’t always listen, that’s that’s fine by me." How are you 6 months old? Half a year. I have no idea where that time has gone, it feels like we have had you forever, yet at the same time it feels like no time at all. 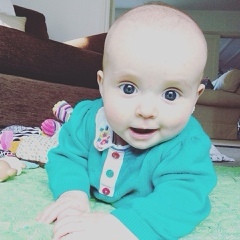 You are a lovely, smiley, happy baby with beautiful big, blue eyes and a little fuzz of dark brown hair. You're changing weekly, daily in fact at the moment and so keen to join in. You have pretty much doubled your birth weight and although it slightly breaks my heart when you grow out of your clothes I'm thrilled that you're clearly thriving. You can sit up for a few minutes or and have rolled from back to front a couple of times and you love to growl at us like a little bear. Your giggle is amazing, I wish I could bottle it, there is nothing quite like that sound. You giggle most at your big sisters who love to make you laugh, you even giggle when they are a bit over zealous with their hugs. You are so patient and tolerant when you have to wait while I do something for Miss Boo or Miss Tibs. You are no trouble at all, in fact sometimes in the nicest possible way we don't even know we have you. 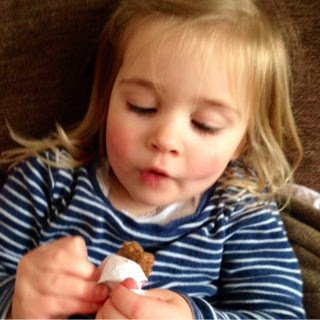 In the car recently Miss Boo asked if we had forgotten you as you quietly and happily fit in to our busy lives with a smile, my heart stopped for a minute before I turned around to see you safely in your seat. We have our time just you and I in the night, frequently in fact... and as tired as I am I don't mind. I'm trying to drink it all in as I hold you in those early hours of the night while you drink your milk clutching tightly to my finger or dressing gown. You love being in the sling and bury your head into my chest in a coy manner when someone says hello. I love it. I love holding you close and how you settle as soon as I scoop you into my arms, I am your safe place and it feels truly wonderful. Your cheeks are just divine and gorgeous to kiss, your sisters like to 'chubby, chubby' them. You still have that lovely baby smell, I hope that stays a while longer. 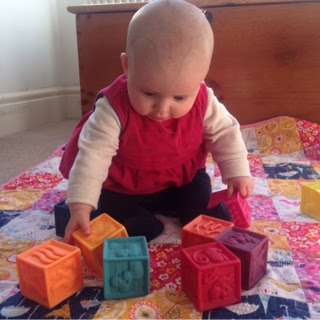 You're starting to explore the world and are enjoying playing with rattles and toys, particularly scrunchy ones.You're also becoming attached to a little snuggly giraffe comforter (which reminds me to get a spare). Your favourite time of day is bathtime and you splash wildly with the biggest of grins when we put you in the tub. 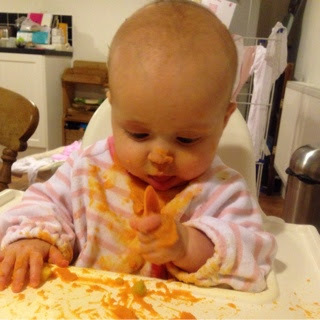 You love food and can pick up bits and bobs from your high chair tray. Blueberries and broccoli are a firm favourite. I'm looking forward to introducing you to lots more things I know you'll love. You have so many adventures to come over the next few months and we'll look forward to sharing them all with you. Your big sisters are desperate for you to crawl, they may change their minds when you actually do and will have to make do with crawling, walking baby annabel in the meantime. I love the dynamic between the three of you and your different relationships with your big sisters. I can't wait to watch those relationships blossom over the coming months and continue to get to know you. You're everyone's baby and we love you so much. Happy half birthday our little dot. when you hear your baby say it for the first time. It's breath takingly amazing. It's recentered me, and taken me to a place where I feel like there is nothing I'd rather be than 'mama' to you Dot and to your big sisters Tibs and Boo. They made the moment even more special you see by cheering and jumping up and down in excitement. They kissed your forehead and told you well done, pioneering you forward and celebrating you in the most perfect of ways. That small, little sound brought such joy and such magic to us and you smiled in such a knowing way before repeating it again for more clapping of hands. Thank you Miss Dot for topping up my tank, for reminding me what it's all about and how the simple things are the things with most value in this world. I could listen to you say it all day and I'm sure like your sisters, you will. Three little voices calling me...and I will always come. 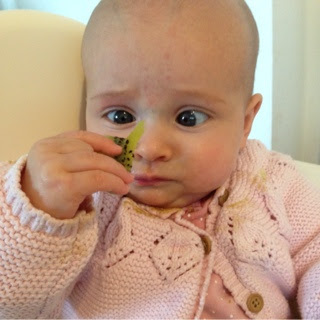 We have started Miss Dot's weaning journey and so far she is absolutely loving her adventures with food. She's not exactly 6 months for a week or so but developmentally ready so we decided to go for it. 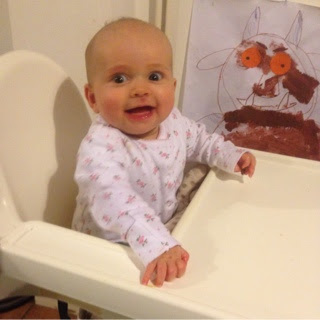 She has been sitting in her high chair for a while now at mealtimes with us and really enjoying the social side of food and watching us very closely. 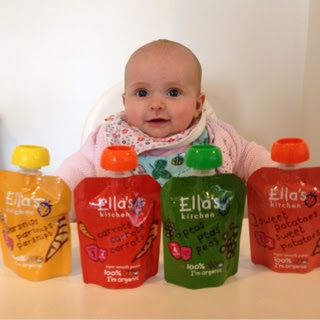 The lovely people at Ella's Kitchen kindly sent us a box of goodies for us to try. 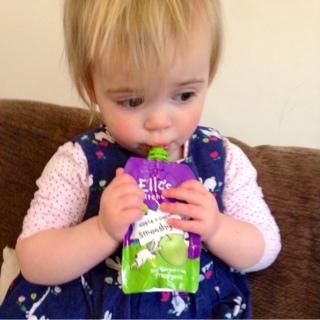 Their stage one pouches were great for Miss Dot's first tastes. I popped a little bit on a soft tipped spoon and gave it to Miss Dot to try. I love all the expressions she made as she tasted and explored the texture of the food and chewed on the spoon. 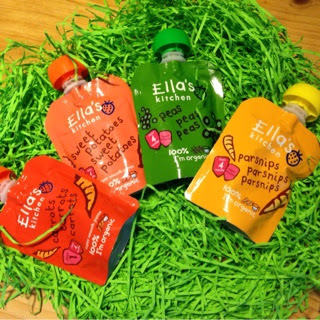 I've used Ella's Kitchen products before when weaning Miss Boo and Miss Tibs and beyond when we were out and about or on holiday, you can squeeze them straight onto a spoon so they are really handy to pop in a lunchbox. 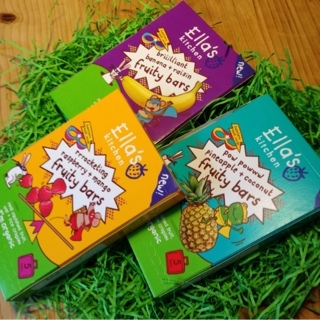 I've always loved mixing the fruity Ella's pouches with natural yogurt to create a tasty low sugar pudding and they are great to mix in with porridge too to give it flavour. We love our Ikea Antilop High Chair, it's literally the best £13 i've ever spent, so easy to clean, with no nooks and crannies for food to get stuck in, it doesn't take up lots of space, looks great and best of all the tray comes off so it can go in the dishwasher or your baby/toddler can sit right next to the table. All in one bibs are an essential, it's a messy business and these protect your little ones clothes underneath so they can get stuck in. 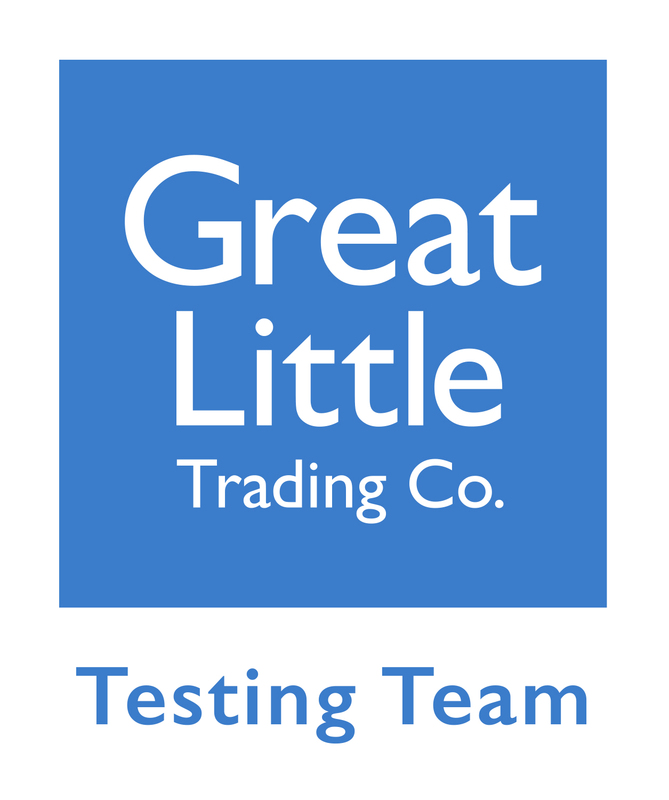 We recently picked a pack of two up in John Lewis for £8.95. 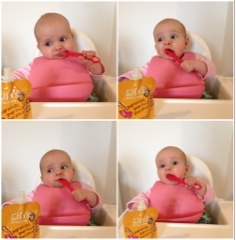 A plastic rubber bib is also a good idea to roll up and keep in the nappy bag for when you're out and about. A lunchbox for keeping food cool and separate to the rest of your nappy bag when you are out and about. We like the Skip Hop Insulated Lunchies which you can get from numerous retailers in lots of fun designs. Don't get me wrong motherhood is the most incredible thing I have ever undertaken, it's changed me as a person, made me better in so many ways and I love it and my babies more than anything in the world. However, I'm all for honest motherhood so I'm just going to throw this out there... sometimes it is really tough. And that's OK, although it doesn't always feel it at the time. I have had a rubbish few weeks which this time I will put down to the torture that is extreme sleep deprivation with three small children to be a mother to. 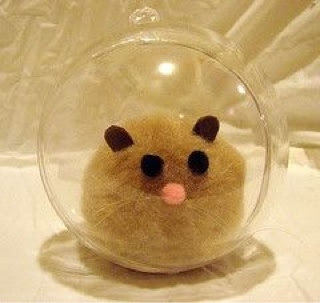 I felt like a little hamster in an exercise ball, running and running and running until eventually I crashed into a wall. I wanted to and needed to get off the mummy train, for just a moment. The worst part was probably that I didn't feel I could say that I wasn't enjoying motherhood right now in that moment, it's not something many people openly say. You only have to log onto social media to see a beautifully filtered feed of motherhood in all it's perfection. 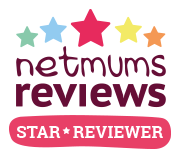 I share our wonderful moments in this way too - to celebrate them and to capture memories in time, they are however a bit like my X factor best bits and not a true representation of daily life. Very few people are posting a 'selfie' having been up every hour with a baby or instagramming the poo explosions at 3am, vomit on their shoulder, children fighting or the pile of rice crispies and milk on the floor that their toddler has chucked off the table, there is no filter for that. The other week when all three of my children were screaming and I had to get them out of the car in the pouring rain into the house at the end of a very long day and a night of absolutely no sleep, resulting in me crying too, that wasn't much fun. Most days I find myself trying to make the tea with a crying baby attached to me, a hungry toddler climbing my leg whining for bread sticks and an overtired preschooler telling me she hates what I'm cooking. I haven't had the opportunity for even a wee for 5 hours, have eaten the children's left overs for lunch and have all the housework and jobs still to do when they go to bed. It's like some sort of continuous 24 hr never ending survival challenge without a second to myself and coming bottom of the pile all the time can feel... A little bit tough. Oli works quite a few weekends which can be quite lonely and the days are long. I make the best of it though and the girls and I have great fun on days out but it has been known for me to carry a child on my shoulders, one in the sling, one in a pushchair and carry a nappy bag when the children have got cold or their legs are tired when we are 20 minutes walk from the car... One desperately needing a wee. You get the picture. That afternoon was a little bit hard. 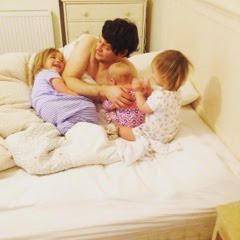 I feel guilty for feeling this (that's a whole other post) as I know I am incredibly lucky to be a mother to three incredible little ladies but that doesn't mean I have to love every minute of it, I'm not superhuman. I am a normal human being, living a normal life, wading my way through motherhood and like anything you do in life there will be ups and downs. We don't always feel comfortable saying we are finding things hard, it leaves us feeling a bit vulnerable I think. I'm acutely aware that there are lots of other people out there with far tougher situations, but it's all relative and over the last few weeks I've learnt that it's really important to say if I'm finding things a bit tricky. When I finally did the other week to Oli, my mum and my dearest friends I felt so much better. I asked for help, I asked for a break and following a little bit of self care it's all good right now. Thankfully the tough bits are heavily punctuated, in fact far outweighed, with amazing, funny, happy, wonderful and 'I can't believe I get the privilege of doing' this bits.